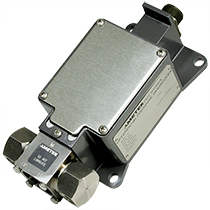 The Model 89 and 89D pressure transducer family is used in many U.S. Navy marine applications including measuring steam, sea water, gases, condensate and many other applications. These transducers are extremely durable, meeting the military standard QPL-MIL-R-24212C(SH) for pressure or QPL-MIL-D-24304B (SH) for differential pressure. These pressure transducers are available in absolute, vacuum, compound, and gauge pressure ranges from 30” Hg vacuum to 6000 psi with a 4-20mV fully adjustable output. The Model 89D differential unit is available from 300 inches of water to 400 psi. The Model 89 and 89D are drop in replacements for any transducer meeting these MIL standards. The pressure connection conforms with MS 16142. They also have non-interacting zero and span adjustments for quick calibration. Accuracy is +/- 1% of calibrated span.